Arguably the most famous street in Europe, the wide tree-lined boulevard known as La Rambla (or Las Ramblas), is a long continuous pedestrian avenue that technically changes names five times as it cuts through Barcelona's Old Town, the Barri Gotic, from the Placa Catalunya to the city's port. It is lined with cafes, restaurants and shops, and is usually thronged with leisurely walkers enjoying the sights and sounds. While simply walking around, people watching, and breathing in the atmosphere, is worthwhile, there are also some notable attractions along the way. The sprawling marriage of nature and creative architecture and ornamentation that is Gaudi's Guell Park is a must. The pretty square of Placa Reial, enclosed by impressive buildings and promising some fantastic restaurants and nightclubs, is a popular social venue and sometimes hosts concerts and live performances. 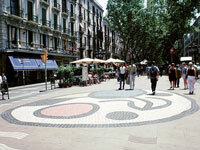 Also look out for the iconic mosaic by Joan Miro as you walk over it, near the Liceu Theatre. The street is wonderful for shopping and attracts all sorts of buskers and street artists. It is a great area to visit at night, but travellers should note that the southern end of La Rambla becomes somewhat seedy after dark and is a sort of unofficial red light district.